For years, I’ve been using the dating app “Tinder”. As of today, I have a grand total of 1706 matches. The well-rounded nature of this number prompted me to celebrate this “feat” by doing an analysis of my matches’ profile descriptions. Why? I was curious as to whether there would be any interesting patterns to be recognized from analyzing a large number of profiles. This in turn would, hopefully, teach me something worthwhile about human – in particular, female – nature. I soon learned that analyzing 1706 profile descriptions would take a terribly long time. Therefore, I limited myself to a mere 200 profiles. My methodology for dissecting individual profile descriptions may be summed up in the following manner: first, I would read the profile description. Then I would proceed to categorize its content as accurately as possible. I was mostly interested in what kinds of things did women want to convey about themselves. Did they want to tell me about to tell me about their occupation? Their hobbies? Perhaps they’d be predominantly keen on describing their musical tastes – who knows? I would categorize this person as someone who would describe their nationalities and their educational background. So I would increment the size of the categories “nationality” and “education” by one. I found that constructing the appropriate categories was itself no easy task. If I wouldn’t be careful, many categories would overlap. Furthermore, my matches are a diverse bunch. For my research, this meant that I could never be sure I had enough categories. There was always a chance that some original statement ought to be classified within one or multiple new categories. Despite these difficulties, it quickly became clear that there were some patterns emerging from the wealth of data I was analyzing. Presented in the bar chart above are the seven largest categories. 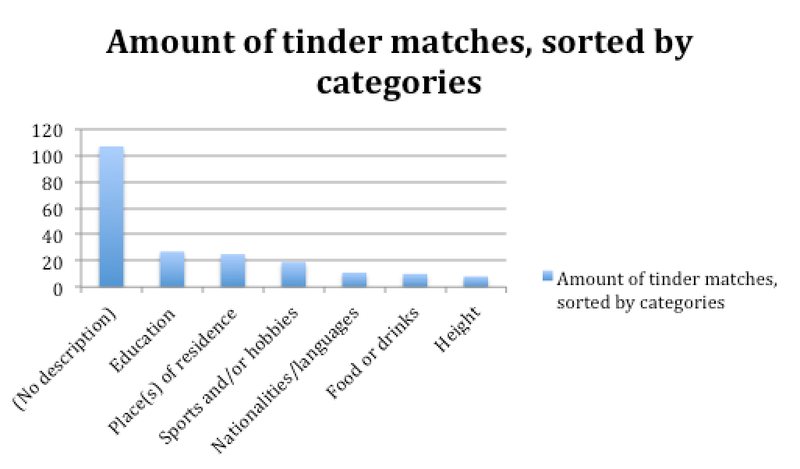 Encompassing 107 matches, the category of matches that hadn’t written anything at all in their profile description was by far the largest. Next came those who had written something about their educational background (27 matches), their place(s) of residence (25), their sports and/or hobbies (19, though it would amount to 29 if I were to include interests, such as “art” or “sustainability”), their nationalities and/or the languages they had – to varying degrees, I suppose – mastered throughout the course of their lives (11) and, finally, their height (8). Being almost four times as large as the second largest category, the category of those matches having not written anything at all in their profile description is by far the largest. Why? As it is often the case, the website quora.com helped me to find an answer to this question. On Quora, people can ask questions and post answers. This may ring a bell: Yahoo Answers is a website that purports to do something similar. However, that’s about the only similarity I can think of. Quora is, in my opinion, much more advanced. The quality of both questions and answers is, in general, higher. Furthermore, it includes social media elements not present at Yahoo. This makes it easy to follow people and topics suited to your own interests. I can recommend this website to anyone. It is a blessing for those craving for reliable information and well-suported arguments on the Internet. Back to our question. “Why?” Why does the majority of young woman on Tinder not write anything in their profile descriptions? The following question on Quora may give us some insight. It reads: Why is it hard for people to describe themselves? Though it does not mention any app, let alone Tinder specifically, it still ought to give us some understanding of the question at hand. As far as I can see, the most highly upvoted answer on this question is the one written by Milosz Dunikowski (cite it). Real problem is not that we can't describe ourselves. We can't really describe anyone. When a random guy on a party is standing by himself he's shy. "He's Tim, he's the shy guy." When I'm acting the same, I'm still an outgoing person, I just had a bad day, or am not feeling it right now... but for everyone else, I'm now "Milosz, the shy guy". And nobody cares that me or Tim are usually talkative, social, outgoing. Everybody got their own thoughts, feelings, past. We can't see them, so we use actions to describe others. Problem is, nobody acts the same all the time. Everyone change constantly. One day we're not talking to anybody, another we're social butterflies. Describing somebody by what we can see is like seeing only the top of the iceberg! It's not the only problem. Our minds are excellent are justifying any action we take - or don't take. When I'm not training, I have an explanation for every single time I skipped my work out, and they all seem perfectly valid to me. For everyone else it just means I'm lazy. To add ever more confusion (nobody said it's gonna be easy!) let's say I often skip my work out... but always show up at running sessions. Am I lazy? Or inconsistent? It's hard to say. Problem with labels is that they don't change. And people do. We can't really describe ourselves - because we believe in our own lies. Labels have limited use when describing people. So far it seems like we should completely avoid labeling anyone. But really, we don't work that way. We need to label other people, so we can stop constantly monitoring them and free our mental resources. And for the Asker I have one advice - try asking your close friends and family to describe you. They have met you enough times to hopefully have an accurate image of you, without believing lies you believe. I think this is an interesting point of view. Milosz raises some very valid points. He writes that we can’t describe others because we tend to oversimplify them due to our inability to see the thoughts and feelings that underlie people’s actions. However, we can, to a certain extent, probe into the depths of our own psyche. We can incorporate the thoughts and feelings we consciously experience and have experienced when we describe ourselves. So the first “major problem” of the three (not two; he probably intended to write “three major problems”) does not apply to our question. The second problem, however, answers a question that is similar though subtly different than our question. Milosz refers to people’s inability to describe themselves accurately and truthfully. However, I suspect most people are hardly aware their conception of themselves is inaccurate or even blatantly untrue. Although their awareness of this fact might prompt them to be more careful when seeking for an appropriate description, I doubt this would prevent them from describing themselves at all. So Milosz gives us reasons to believe my matches’ profile descriptions are not as accurate as they or myself would think. However, the first two major problems he describes do not answer our question yet: why do most of my matches on Tinder refrain from writing about themselves at all? This brings us to Milosz’ third problem: labels have limited use when describing people. As he wrote, people behavior is subject to a lot of change. It depends on people’s moods, thoughts, feelings, their environment, recent and less recent events et cetera. This makes it a lot harder to capture people’s true nature. By using labels to describe a person, whether this person is someone else or oneself, one risks sketching a crude caricature of the complex nature of his or her personality. This may especially be true for ourselves. We are able to see beyond the tip of our iceberg we present to others. We all have our own submarine, by means of which we can see the submerged part of our iceberg, however clouded our view of this part of the frozen constellation may be. As we have access to a bigger picture of the iceberg – a frozen floating block of contradictions and complexities – it becomes even harder to capture its characteristics. Considering the fact that Tinder only allows one to describe oneself within 500 characters, articulating a description of ourselves becomes a daunting task. We have already established it is hard to describe ourselves in the previous paragraphs, let alone do so concisely. However, we have slightly digressed from our original question. Though Milosz’ answer provided us with some understanding to the question “Why is it difficult for people to describe themselves?” I think we ought to critically examine the assumption that people indeed wish to do so on their Tinder profiles. Why would people be inclined write anything at all on their Tinder profiles? I can think of myriad reasons to do so. One of them is that profile descriptions can provide people with conversation starters. Starting a conversation out of the blue with someone you don’t know can be hard. Being able to ask or say something about someone else’s profile description makes this easier. Another reason is that revealing a part of your identity may give the people a better idea of whether they are a good match – not just on a superficial, physical level, but also on a personal level. You can show how funny, athletic, sporty, spontaneous or intelligent you are. With regards to the last characteristic, this explains why many women mention their educational backgrounds. Their athleticism or sportiness shines may be communicated when they mention their favorite sport. Yet another reason is more practical: providing information about your place of residence gives an indication of how hard or easy it is for (potential) matches to meet up with you; whether that’s on a regular basis, a couple of times or just once. Telling others about your nationality or the languages you are able to speak allows people to gauge whether they could potentially effectively communicate with you. And yet, when given the opportunity, most women choose not to write anything at all about themselves. Why? Again, I turned to Quora to find out. Here’s a question question I asked. Because men don’t read them. I once put an easter egg in my dating profile, not even hidden, that said something like, “If you’ve read this and decide to message me, write “I READ YOUR PROFILE” in your first message. 150 messages later, not a single man said he read my profile. I find Myra’s results staggering. I already suspected most women are the ones being pursued (not the other way around) based on their physical characteristics (which is, after all, what Tinder is, at least initially, all about), so they would be less inclined to put any effort into writing a profile description. I had not expected it would be this extreme though. Being someone who just about always reads the profile descriptions, I’m extremely surprised 150 people hadn’t read Myra’s profile description. I guess here we have our answer. But I’m curious about your opinions and experiences, too! Please let me know in the comment section.